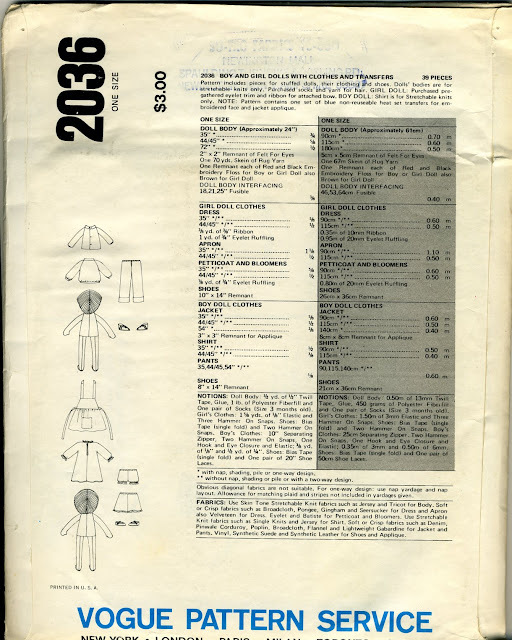 Vogue pattern #2036 is not dated, but I would guess it to be from the early 1980s. Peter and Polly are 24" boy and girl dolls made from stretchable knit fabric. She is dressed in old fashioned style, while he wears more contemporary clothing. A transfer is included for their faces. Both dolls are made from the same body pattern. They have flat faces with small round stuffed noses. The backs of their heads are made from four sections, like the segments of an orange. Their torsos are seamed at the centers and sides, and have some shape. They have mitten hands and front seamed legs with flat soles. Arms and legs and stuffed first, then attached to the torso. The dolls have appliqued felt eyes and embroidered noses and mouths; Polly has embroidered eyelashes and freckles. 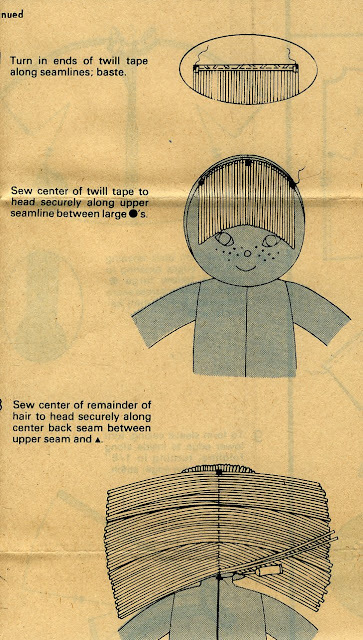 Their hairstyles are created by stitching rug yarn to twill tape, then stitching the tape to the heads, and gluing the hair in place. Polly wears a simple long-sleeved dress with eyelet ruffle trim, apron, petticoat and bloomers. Peter wears a long sleeved shirt, pants with rolled up hems, and a jacket with front zipper and appliqued sailboat motif. The instructions called for hammered on snaps, and a zipper for Peter's jacket, both of which are unusual in doll clothing construction. Vinyl, synthetic suede or leather are recommended for their shoes. They wear purchased 3 month size socks. These are fairly simple dolls, but with some unusual details. If you have made this pattern, please leave a comment and tell us about your experience.